Fabulous I was out done by the beauty of the car the process was seamless and my sales person Chris was outstanding he went above and beyond i was very thankful of his kindness and straight fowardness. Thanks alot Chris i will definitely send you some referrals. I really appreciate everything you guys did. chris davis was very helpful also has a positive attitude very helpful in the choice of car to fit my needs. i recommend Chris to any friend family to come here and ask for him.Really appreciate all your hard work !!! My experience here at World Hyundai with Chris was very pleasant he was adequate and eeficient kept the process moving there were no delays easiest car buying experience ever thank Chris !!!!!!!!!!! Genuine personality great work ethic definitely a keeper. I have been here at World Hyundai twice and each time has been a great experience. 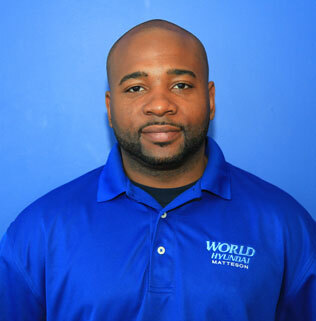 Christopher Davis has helped both times and has put me in vehicles that were both satisfying and affordable. He's very paaionate about the customer and does eveything he can to satisfy us. The other staff is pretty friendly too. he was very helpful, polite and thorough. he made the car buying experience easy and fun. I just want to say that even though I couldn't afford that vehicle I wanted, Chris Davis made my car buying experience enjoyable. He made me feel comfortable and not pressured. He truly assisted me in make a decision that was right for me. Thank you Chris and may God continue to bless you in your career at World Hyundia! I AM SO GREATFUL TO WORLD HYUNDAI FOR THE COMMETMENT OF FOLLWING THUR ON HELPING ME FIND A VEICHAL I LIKE AND EBONT WATERS COURTESY AND PROFESSNALISM THANKYOU SO MUCH. Ebony was very warm, friendly and very helpful. Ebony made this a very smooth, and pleasant exprrience. I will definately be sending referal to Ebony as I was an referal, by someone she made such a great impression on. Ebony is truly a valuable asset to your company. I've been to5 dealerships in 2 days, Chris has been not only the most helpful person I've worked with, but he was the only reason I purchased a vehicle today. He fought to get thecar at a place where i could afford a brand new vehicle. He didnt hype me up with rebates on a car i couldn't afford. He was honest, personable, and charismatic as hell. Ebony expressed interest in msking sure I was satisfied with my purchase. She made sure I was happy with my selection! Great customer service. I would like to thank Ebony Waters for all her hardwork and persistence in geeting me into a vehicle that not only is nice but so affordable. She was very patient and encouraging thru this process. Thanks to the whole team that helped make this happen. My sales rep displayed great customer service quailties, Ebony was professional, knowledgable, and patient. Also, Ebony met all my need to provide me with the I want.